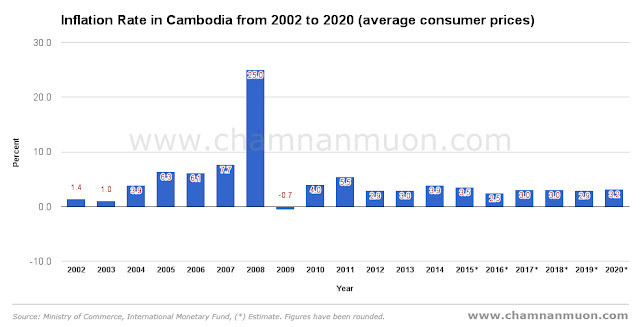 This statistic shows the inflation rate in Cambodia from 2002 to 2015, with projections up until 2020. Inflation as measured by the consumer price index reflects the annual percentage change in the cost to the average consumer of acquiring a basket of goods and services that may be fixed or changed at specified intervals, such as yearly ~ World Bank. The inflation rate in Cambodia was recorded at 3.5 percent in 2015. It averaged 5.3 percent from 2002 until 2015, in May of 2008 as a small, open economy, Cambodia is particularly sensitive to price developments in the world economy, and due to its total dependence on externally-supplied energy sources, the hike in the global oil price in the previous year and this year was having an impact on Cambodian inflation performance. Surging international food prices had also driven local prices to rise, pushing Cambodia's inflation rate to a peak of 25 percent ,and a record low of -0.7 percent in 2009. The projected average inflation rate amounted to about 3.2 percent in 2020. Check out the interactive chart here!